To repair laptop battery you have to replace cells and to resetbattery EEPROM . Cells replacement is easy and can be made by any technician with a spot welder. 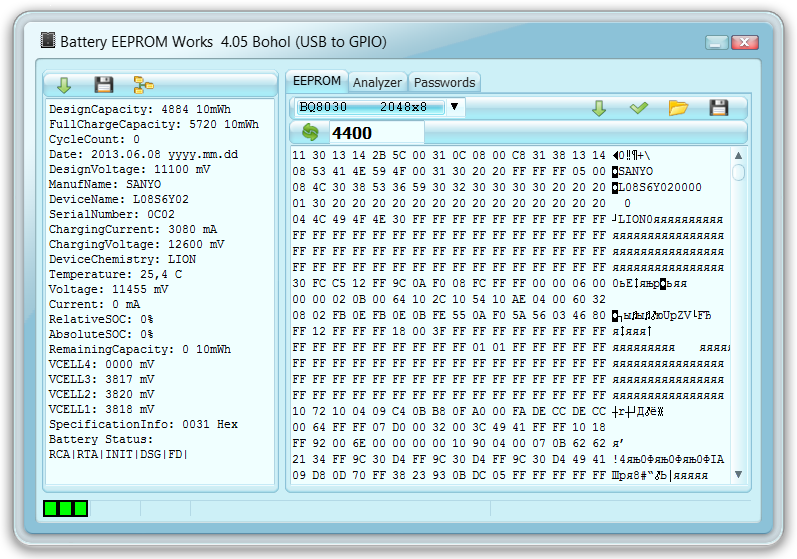 But EEPROM fixing is very complicated and can be made only by person with special skills and equipment. Reads SMBus data from laptop battery terminals. Reads and writes all EEPROM chips used in laptop batteries. Reads and writes Data Flash and EEPROM of chips with integrated memory. Saves the dumps of Data Flash and EEPROM in BIN format. Resets (renews) chip data to factory new values in 1-click. One-Push-Reset for M37512 based batteries. Any password for BQ20Zxx and BQ208x in 5 seconds. Connect several adapters to your PC and work with several batteries simultaneously. 93C66, 93C76, S29194A, S29394A, AK93C45A, AK6440A, AK6480A, M95640, BR9040. © 2016. Private Person. All Rights Reserved.